Stories are the fabric of our community. Come hear stories on the the theme: "To Be Determined." Enjoy live local music, your BG friends and family, and a cozy evening. Front Porch is sponsored and organized by Connect Battle Ground and partnership between BG Burgerville, Battle Ground Foursquare Church, Full Circle Driving School, Columbia Kids Preschool/Sprouting Seeds Learning Community, Gaither & Sons, Elite Auto Body, Artisan Academy, and the Old Town Battle Ground Association. Bring your friends & neighbors! All proceeds generated by The Front Porch events go toward local charities. In August, that charity is School Readiness. All food, drink and decor is paid for by our financial sponsors. That way, our vendors are covered and all the money spent at the event goes straight to our community charity. 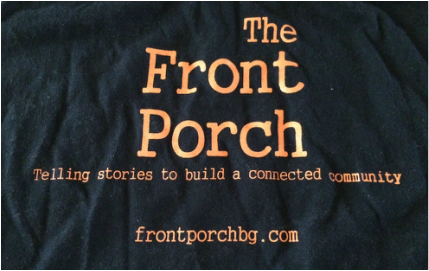 If you are interested in supporting The Front Porch, please donate using the button below. Thanks in advance!